The annual number of NHS contracts being tendered for clinically related work is unchanged. 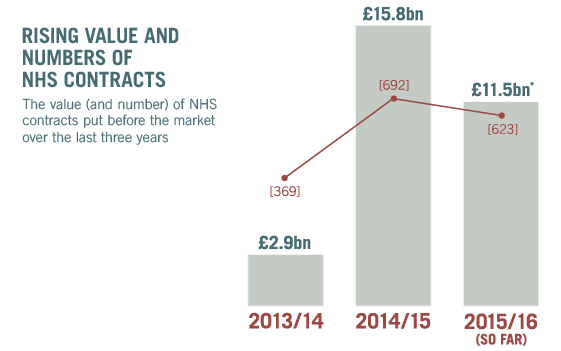 Over six hundred NHS contracts (623) were put before the market in the first 3 quarters of this year 2015/16. The count is on target to at least match last year’s (2014/15) total of 692. 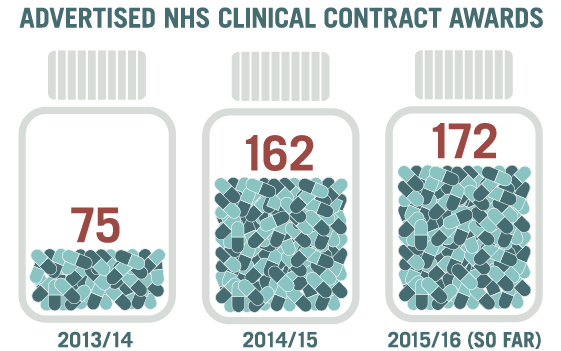 172 clinical contract awards have been advertised so far in 2015/16 already passing last year’s total of 162. Around a third of tender notices result in advertised awards. Testing of the market by commissioners and under reporting of awards are both likely factors. What are the trends since the Health and Social Care Act? Activity has risen significantly since the first year after the Health and Social Care Act came into effect (2013/14), when the £789m worth were awarded through tendering compared with £6bn already this year. Overall the NHS Support Federation study has found that £16 billion of NHS clinical contracts have been awarded through the market since April 2013 (411 contracts). In total around £30 billion worth of NHS contracts have gone before the market, although just over half this value has been awarded. Over this time the private sector has won nearly £5.5bn worth. The value of awarded contracts so far in 2015/16 is nearly £6bn. The total is unlikely to reach the £9bn total for 2014/15. However last year’s figure was inflated by one significant contract – a £5bn framework agreement to provide commissioning support services (see update below). At present a further £5bn worth of notices are in the pipeline, but not yet awarded. Looking at the larger contracts; there were 13 awards made for contracts for over £100m in 2014/15. So far there have been 11 contracts of this size awarded in the first 3 quarters of 2015/16. One of these was the Cambridgeshire and Peterborough contract which subsequently collapsed. 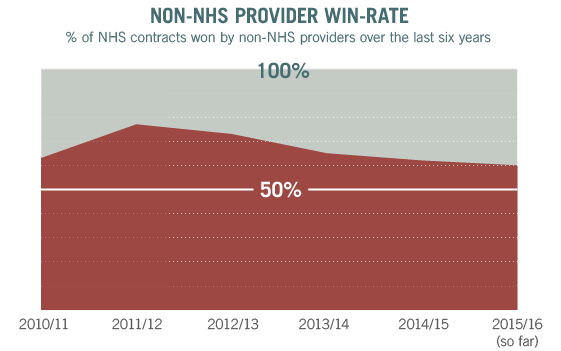 Who is winning NHS contracts? So far in this financial year (2015/16) the private sector has won just over £2.1 billion worth of clinically related NHS contracts (37%). The not for profit sector (mainly community interest companies) have picked up £955 million worth of contracts (16%) and the NHS has won £2.7 billion worth. In terms of numbers of contracts the non NHS bodies continue to take the larger share (60%) and the NHS (40%). Which services are being most marketised? What’s the source of our data? 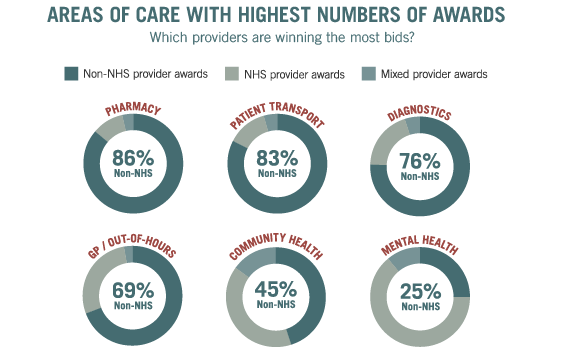 The data has been collected by recording submissions between April 2010 and Jan 2016, by all NHS Commissioners (CCGs/trusts/NHS/gov), on the official tendering websites. From the subsequent analysis we have identified the services that are being put before the market, the providers that are winning these contracts and crucially how this has changed in recent years. Please consider making a donation to help us continue investigating the full impact of the government’s NHS policies. Copyright © 2016 NHS Support Federation, All rights reserved. You are receiving this email because you signed up on our website or to one of our campaigns. Next Post NHS protests Fri/Sat – Manchester, Wigan, Wilmslow – all supporters should attend!